Puppet device runs on both *nix and Windows. The Puppet device application combines some of the functionality of the Puppet apply and Puppet resource applications. For details about running the Puppet device application, see the puppet device man page. In a typical deployment model, a Puppet agent is installed on each system managed by Puppet. However, not all systems can have agents installed on them. 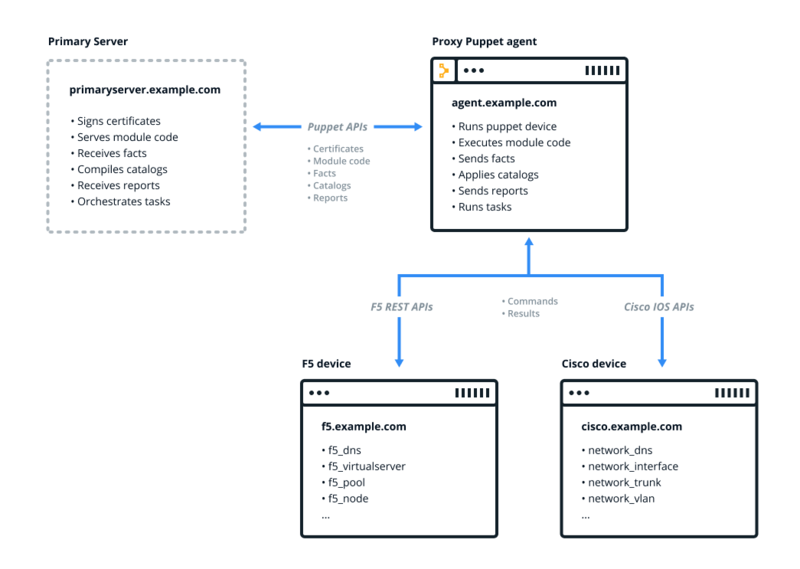 For these devices, you can configure a Puppet agent on another system which connects to the API or CLI of the device, and acts as a proxy between the device and the Puppet master. In the diagram below, Puppet device is on a proxy Puppet agent (agent.example.com) and is being used to manage an F5 load balancer (f5.example.com) and a Cisco switch (cisco.example.com). Puppet device runs as a single process in the foreground that manages devices, rather than as a daemon or service like a Puppet agent. The puppet device command runs with the privileges of the user who runs it. By default, Puppet device outputs directly to the terminal, which is valuable for interactive use. When you run it as a cron job or scheduled task, use the logdest option to direct the output to a file. To view these logs on Windows, click Control Panel → System and Security → Administrative Tools → Event Viewer. You can increase the logging level with the --debug and --verbose options. In addition to local logging, Puppet device submits reports to the Puppet master after each run. These reports contain standard data from the Puppet run, including any corrective changes. Puppet device creates outbound network connections to the devices it manages. It requires network connectivity to the devices via their API or CLI. It never accepts inbound network connections. You need to install the device module for each device you want to manage on the Puppet master. You can specify multiple devices in device.conf, which is configurable with the deviceconfig setting on the proxy agent. The string in the square brackets is the device’s certificate name — usually the hostname or FQDN. The certificate name is how Puppet identifies the device. For more information, see device.conf. Some device modules require the proxy Puppet agent to be classified with the base class of the device module to install or configure resources required by the module. Refer to the specific device module README for details. Apply the classification by running puppet agent -t on the proxy Puppet agent. Classify the device with resources to manage its configuration. The examples below manage DNS settings on an F5 and a Cisco IOS device. Apply the manifest by running puppet device -v on the proxy Puppet agent. Note: Resources vary by device module. Refer to the specific device module README for details. The traditional Puppet apply and Puppet resource applications cannot target device resources: running puppet resource --target <DEVICE> does not return data from the target device. Instead, use Puppet device to get data from devices, and to set data on devices. The following are optional parameters. Running the puppet device or puppet-device command (without --resource or --apply options) tells the proxy agent to retrieve catalogs from the master and apply them to the remote devices listed in the device.conf file. Follow the steps below to run Puppet device in a production environment, using cisco_ios as an example. Install the module on the Puppet master: sudo puppet module install puppetlabs-cisco_ios. The puppetlabs-device_manager module manages the configuration files used by the Puppet device application, applies the base class of configured device modules, and provides additional resources for scheduling and orchestrating Puppet device runs on proxy Puppet agents. For more information, see the module README. These options are useful for troubleshooting Puppet device command results.